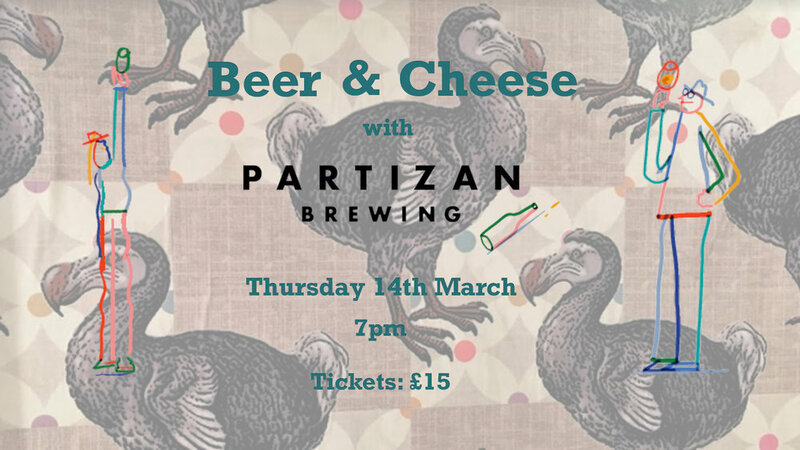 Super excited to be having Bermondsey’s Partizan Brewing join us on Thursday 14 March for a Beer & Cheese Tasting Night! This is a ticketed event and you can grab your tickets in person at The Dodo Micropub or use the Eventbrite link provided (there is a small booking fee though)! Tickets are £15 each and gets you 5 beer samples from Partizan’s exciting range, cheese pairings to accompany the beers and 10% off all your favourite Partizan bottles for the rest of the night! Our Partizan Beer & Cheese Tasting will kick off from 7pm and there are 20 tickets available! Book early to avoid missing out!